If you’re planning a new online venture, or are simply sick and tired of losing to competitors in organic search, then you need to do an SEO competitor analysis. Your competitors are a goldmine of information that can inform every aspect of your SEO strategy and help to skyrocket your website’s organic traffic. Learn what works and what doesn’t in your industry. Find competitors’ weaknesses, and capitalize on them. Find competitors’ strengths, and replicate them. Understand what SEO tasks to prioritize going forward. Understand how difficult outperforming competitors in the SERPs is likely to be. 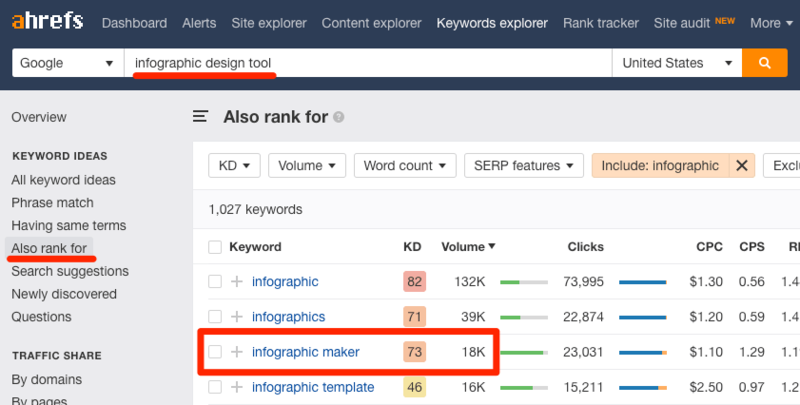 In this post, I’ll run through a simple SEO competitive analysis process for a hypothetical new infographic design tool—Minimagraphic.com. 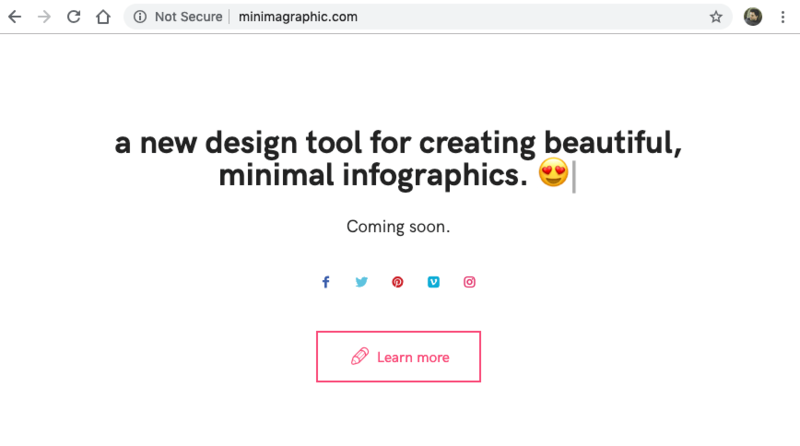 Minimagraphic.com—a hypothetical new infographic design tool launching soon (maybe). I’ve also included a competitive analysis template so you can follow along with your site. Got it? Let’s get stuck in! Before we do anything else, we first need to identify our main competitors. These are the websites that are competing for our desired keywords in organic search. For our hypothetical infographic design tool, some competitors that spring to mind right off the bat are Canva, Piktochart, Infogram, easel.ly, and Visme. However, our organic search competitors may not be the same as our direct business competitors. So let’s first look at how potential customers might search for our service. 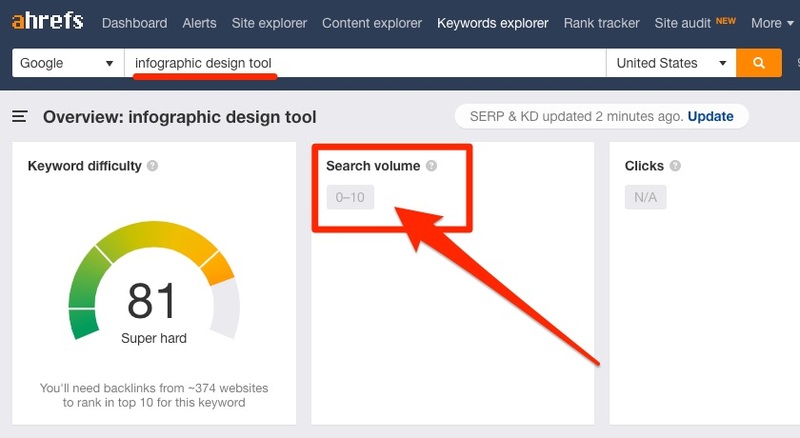 I figured this would be something like “infographic design tool,” but it seems I was wrong as when I search for this in Ahrefs Keywords Explorer, it tells me there is no search volume. So let’s check the “Also rank for” report and see if we can find a better keyword. It looks like “infographic maker” is the most popular way people search for such tools. Now let’s check the SERP overview to see who currently ranks in the top five. Run a Google search instead. Looks like our top five competitors are Piktochart, Venngage, Canva, Visme, and Infogram. Interestingly, Easel.ly didn’t make the cut as they don’t rank in the top 10. That’s why it’s important to not to rely on your instincts for direct business competitors. To reiterate, they’re not always competitors when it comes to SEO. To give a more vivid example of this, imagine you’re a butcher in a small town. The business that keeps you awake at night is the other small butcher down the road. However, in terms of SEO, they’re no threat. They don’t even have a website. I’ll add these five competitors to my spreadsheet. 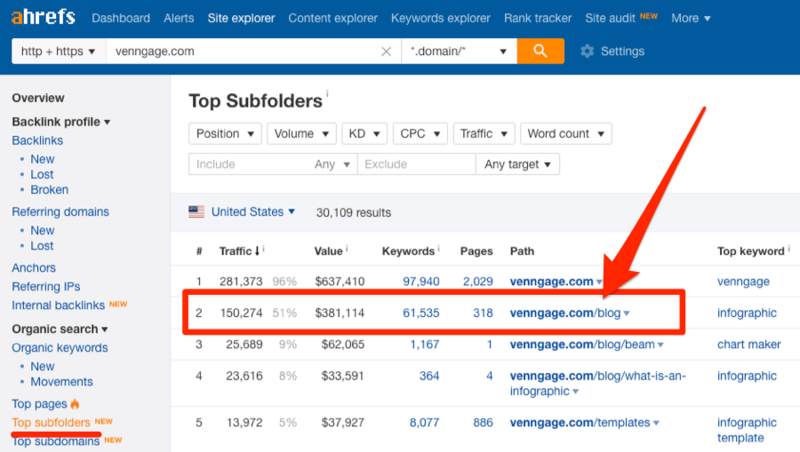 If you’re trying to find competitors for a blog or ecommerce site, then finding the sites that rank for a single keyword may not be the best way to go about things. That’s because you’re likely targeting hundreds or thousands of keywords and topics across many pages. So it’s better to see who’s competing with you across the board. 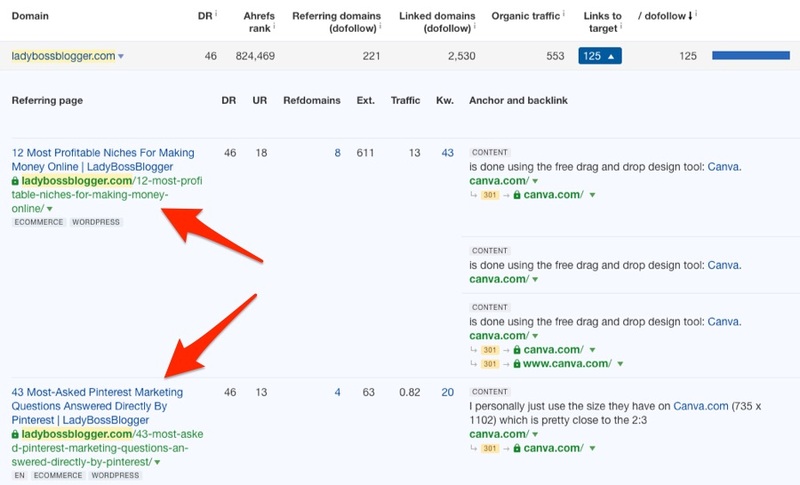 For that, you can use the Competing domains report in Ahrefs Site Explorer. Next, we need to get a high‐level view of the competitive landscape. To do that, we’ll pull a few key stats and SEO metrics which should give us an idea as to how entrenched the competition is. Let’s use Ahrefs Batch Analysis tool to do this for all competitors websites at once. Let’s add them to our spreadsheet. Domain Rating (DR): A high DR score indicates that a website has a solid backlink profile. You should judge DR relative to your site rather than in absolute terms. For example, if your site is DR30 and your competitor’s is DR50, that’s a fair bit higher. If your site is DR30 and a competitor’s is DR90, that’s like comparing your mom and pop store to Walmart—they aren’t your competitor. Ahrefs Rank (AR): A low Ahrefs Rank is indicative of a “strong” site. AR tells you the same thing as DR but with more granularity. For example, if you have two competitors with DR33 websites, you can use AR to see which is the strongest of the two sites. Referring domains: A high number of referring domains can also indicate a strong site—provided that those links aren’t low‐quality. Note: This is why it’s also useful to grab DR, as this takes into account both the quality and quantity of links to a site. Organic traffic & keywords: This one’s pretty obvious—the higher these numbers are, the better the site is performing in organic search. In simple terms, the more distance there is between yours and your competitors’ stats, the more catching up there is to do. However, these metrics don’t tell us everything about our competitors’ SEO progress. In steps #3, #4 and #5, we’ll delve deeper into competitors’ link profiles. Link popularity is a clear SEO “ranking factor” according to our study of ~930 million pages. This is the result of a correlation study. It doesn’t prove causation. So we need to learn more about our competitors’ link building efforts. Let’s begin by checking the rate at which they’re acquiring new referring domains (linking sites), as that’ll give us a rough target to shoot for with our link building. To do this, we’ll use Ahrefs Site Explorer. The 12‐month cumulative referring domains graph for visme.co. For each competitor, we’ll take the number of referring domains they have today minus that same number from a year ago, then divide by twelve to get a monthly average. This is the cumulative growth or decline in referring domains. For example, if a competitor gets links from a hundred new RDs in a month but loses links from ten existing RDs, their cumulative growth is ninety. Let’s also check the growth trend for our other competitors. In other words, do their link profiles show consistent or inconsistent growth or decline? For Venngage, aside from a small blip earlier this year, their growth has been relatively consistent. The 12‐month cumulative referring domains graph for venngage.com. This could be natural, or it could be the byproduct of long‐term link building efforts. 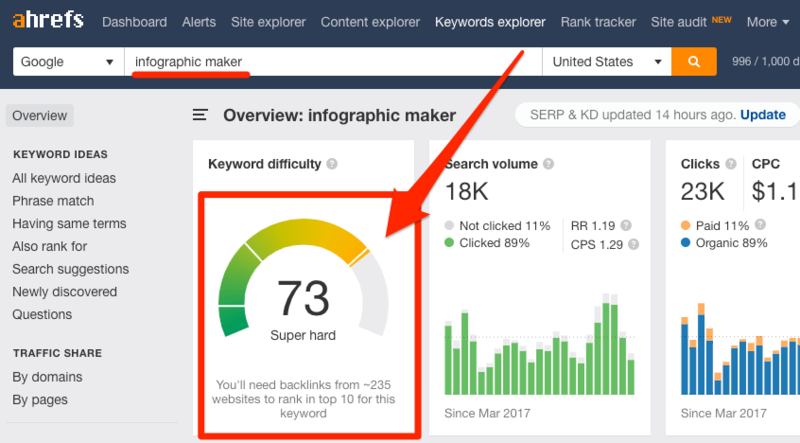 Either way, it’d be well worth following these two articles to delve deeper into their backlink profile to see what we can learn… once finished with the basic competitive analysis, of course. For Piktochart, their growth seems more inconsistent. 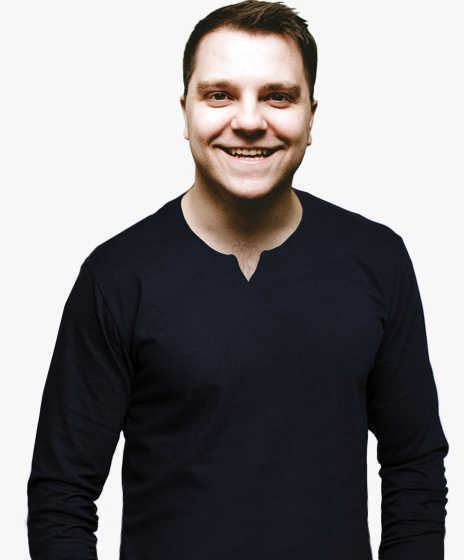 They experienced “hockey stick” growth between May and July last year, which may be indicative of a specific piece of content performing well, or them ramping up their existing link building efforts. It could also indicate a negative SEO attack. To get a sense of which, we can check the New referring domains report. It’s likely down to a particular piece of content doing well if most of the links point to the same web page. If the spike happened recently, use the Best by Link Growth report in Site Explorer to help identify which piece of content attracted the links. It’s likely the ramping up of existing link building efforts if you see lots of links from a specific type of content—e.g., guest posts, resource pages, etc. For now, I’ll add some growth‐related stats for each competitor to my spreadsheet. Superfans are those who’ve linked to our competitors on multiple occasions. These are people with whom it may make sense for us to build relationships because they tend to link out to websites they like regularly. To find these people, we can check the Referring domains report in Ahrefs Site Explorer. Let’s start by skimming the list for industry blogs. If we hit the caret, we can see that this site links numerous times across many blog posts. Five seconds looking at the site tells us this is a single author blog by a woman named Elaine—she’s definitely someone with whom we may want to build a relationship and introduce to our product. Let’s find five superfans for each of our competitors and add them to our sheet. Ever heard the saying that one person’s junk is another person’s treasure? That rings true on the web too. So now we’re going to see if our competitors’ websites for a specific type of junk: broken pages. To do that, we’ll use the Best by links report in Ahrefs Site Explorer. I’m searching for content on a subdomain here so that I only see dead informational pages—e.g., blog posts, infographics, etc. Asking them to swap out the dead link in favor of our working resource. Learn how to execute this strategy in our broken link building guide. For now, as the focus of this guide is competitive analysis and not link building, let’s just add any relevant broken pages from our five competitors to the spreadsheet. The following steps (#6, #7, and #8) focus on organic traffic. 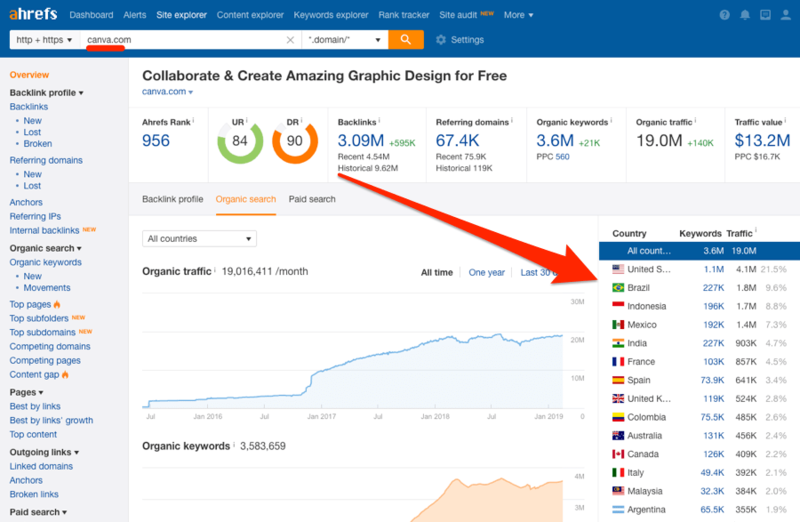 Knowing which countries our competitors get the bulk of their organic traffic from can help us to understand where the opportunity lies in this niche. For this, we’ll use Ahrefs Site Explorer. Let’s add the top five countries along with their traffic percentages to our spreadsheet. I’ll then do the same for our other competitors. Looks like United States is where the bulk of the traffic opportunity lies in this niche, as this is where our competitors get ~31% of their traffic from on average. 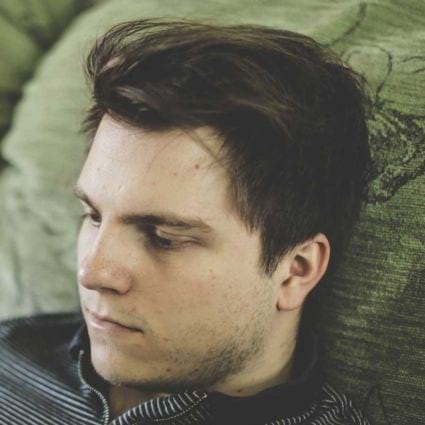 There’s some opportunity in other English‐speaking countries like the UK and Canada too. So we now know that we should almost certainly prioritize content creation for folks in these countries, as this is where we see the bulk of search demand. However, the fact that there’s traffic potential in Latin America and Asia has got me thinking: perhaps it would make sense to translate our hypothetical landing pages into Spanish, Indian, and possibly Indonesian? We could even launch a multilingual blog to maximize traffic from these countries. That’s what we did here at Ahrefs—we have a Spanish blog and a Chinese blog. The Spanish version of the Ahrefs Blog. The Chinese version of the Ahrefs Blog. Many of our landing pages are available in multiple languages too. The Spanish landing page for Ahrefs Site Explorer. Looking solely at organic traffic numbers can be misleading because it’s not always representative of traffic value. 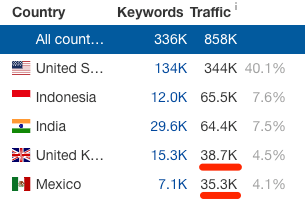 For example, Visme gets roughly the same amount of search traffic from the UK and Mexico. The estimated value of Visme’s organic traffic from the UK. The estimated value of Visme’s organic traffic from Mexico. … we see that UK traffic is worth 700%+ more! So it likely makes sense for us to prioritize UK traffic growth. Learn more about how we calculate Traffic value. Next, we want to find out which keywords are currently driving organic traffic to our competitors’ sites. We can do that by running the Organic keywords report for each domain. 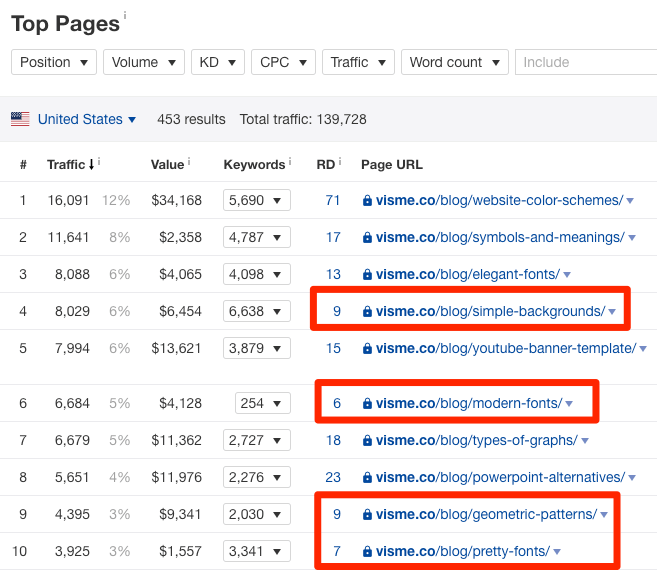 Above we can see that visme.co currently ranks for 133,667 keywords in the US. By default, the Organic Keywords report shows keyword rankings for the country that generates the most search traffic. That’s fine for us, but if you want to see keyword data for a different country, hit “more” and choose from any of the 150+ countries in our database. Now let’s look for some juicy keywords that might be worth targeting. There are a few that jump out right away such as “infographic maker,” “infographic creator,” etc. But there are also a lot of irrelevant results muddying the waters. So let’s first exclude all branded keywords with the “exclude” function. I’ll also filter only for keywords for which our competitor ranks in the top 10 so that we only see the most relevant keywords. I’m going to keep things simple for now and note down the top five relevant, non‐branded keywords sending the most traffic to our competitors, and their search volumes. Some of those keywords would be a good match for our homepage. Others would make better blog posts (e.g., “what is an infographic?”). If you’re following along and are only interested in finding keyword ideas for your homepage, use the “URL” mode in Site Explorer as opposed to “*.domain/*”. That way, you will only see keyword suggestions from the homepage instead of the whole site. And don’t forget to exclude branded searches from the report! Some of the keywords I noted down have high Keyword Difficulty (KD) scores, which means they’ll be tough to rank for without building lots of links. 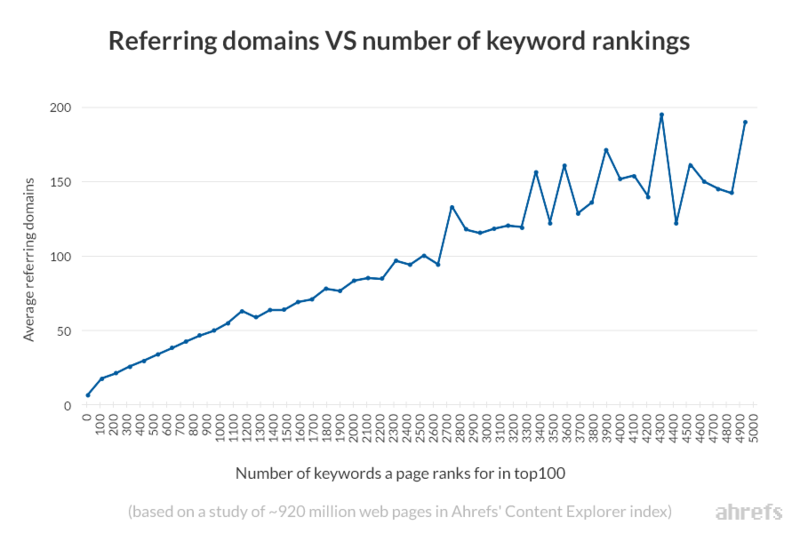 … and will require backlinks from an estimated ~235 domains to rank in the top 10. 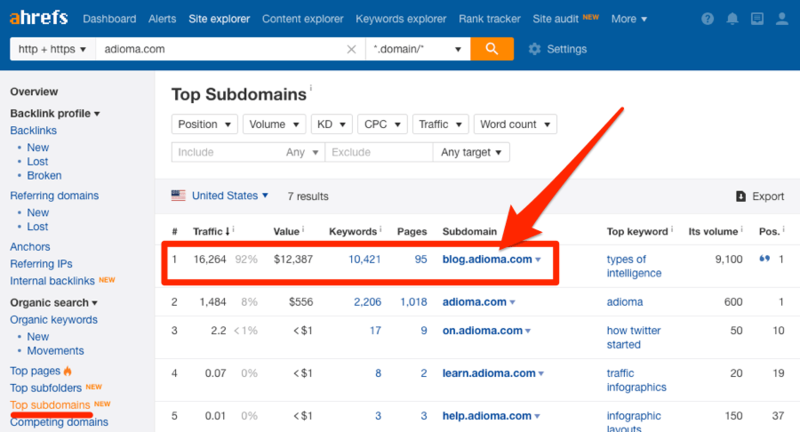 Recommended reading: Learn more about how we calculate Keyword Difficulty. I’m not too concerned about this right now because I’m looking more for “ultimate goal” keywords. If you’re following along and would prefer to find keywords that you stand a chance at ranking for in the short‐to‐medium‐term, feel free to filter for keywords with a low KD score. SERP features for which your competitors rank. So let’s keep things simple and focus solely on those. 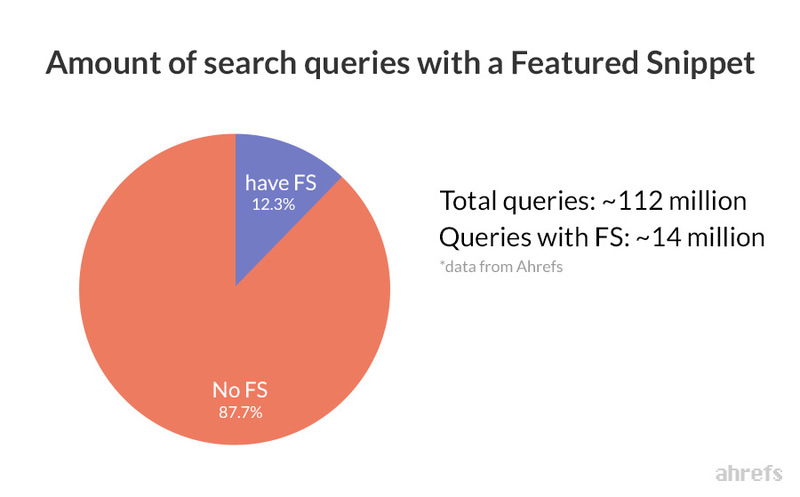 First, I want to know which featured snippets our competitors own and for that, I’ll use Ahrefs Site Explorer. 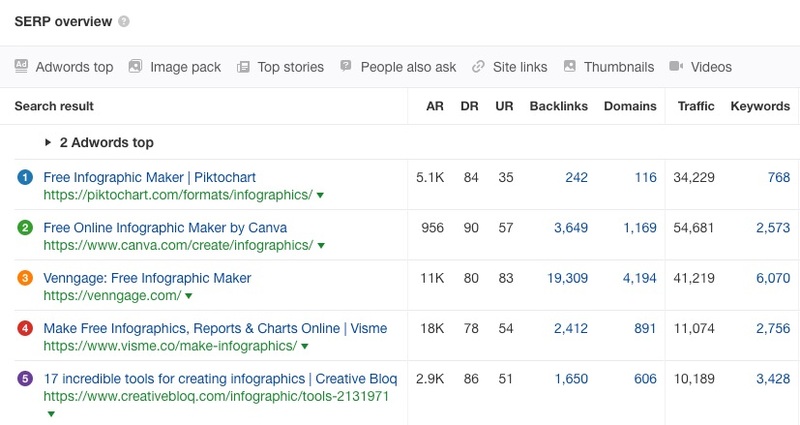 Piktochart owns 87 snippets in the US right now and gets a fair amount of traffic as a result. I’ll add these numbers to my sheet for each competitor. 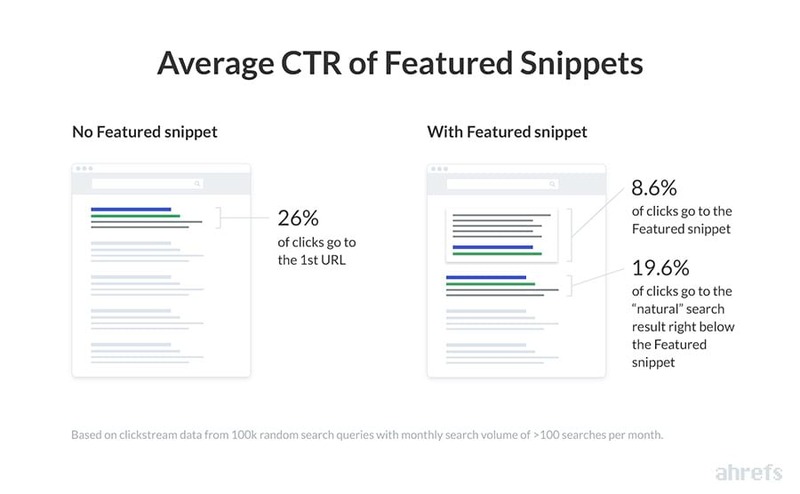 Generally speaking, if our competitors rank for a lot of featured snippets, there could be an opportunity for us to do the same. This can even be easy traffic because it’s not always the #1 ranking page that owns the snippet. 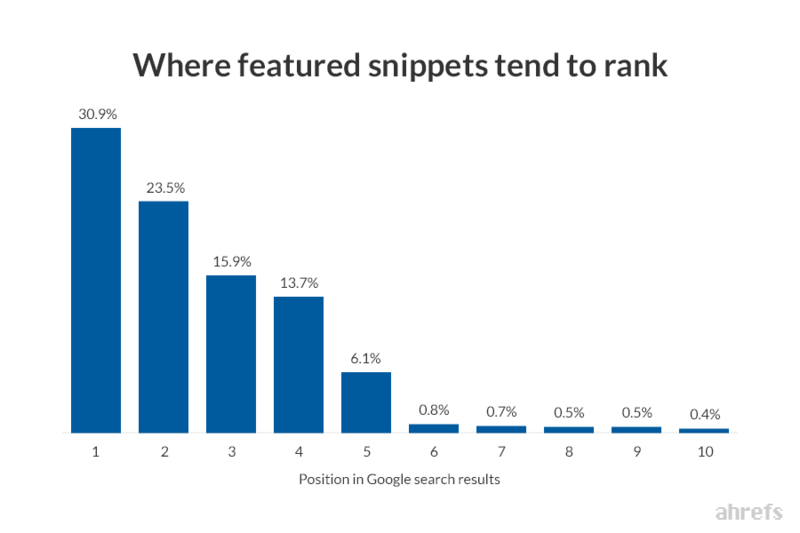 59.2% of featured snippets come from pages ranking in positions 2–5. In other words, even if the SERP is competitive, there’s still a chance of owning the snippet provided that we can make it to the top 5. In the few steps (#9, #10, and #11), we’ll delve deeper into competitors’ content. Content gaps are keywords for which your competitors rank, but you don’t. Needless to say, that’s a gap you’ll likely want to fill. To find content gaps, we can use Ahrefs Content Gap tool. You can see that this prefills the “But the following target doesn’t rank for” field with our domain. Now we need to fill the other fields with competitors. I’ll then set it to “Show keywords that all of the below targets rank for,” tick the “at least one of the targets should rank in the top 10” box, and run the search. You can see that this returns some quite relevant keywords above. If you’re following along and don’t see any relevant keywords, feel free to loosen the settings a little and find keywords for which two, three, or four of your competitors rank, rather than all of them. Now, as we don’t have unlimited resources, targeting all these keywords is an impossible task. Let’s use the filters to focus in on low/medium difficulty, high‐volume opportunities. The low difficulty score means they will be easier to rank for, while the solid search volume means that ranking will give a nice bump to our search traffic. However, some of these keywords look to be ones we already found in the previous step. So I’m just going to add the five most relevant new keywords to my sheet. Keyword research is still a critical part of SEO but these days, Google’s understanding of the intent behind searches is arguably better than ever. For that reason, one page can easily rank for hundreds or even thousands of long‐tail keywords. Then we can write about these overarching topics and earn some sweet long‐tail traffic. For this, we can use the Top Pages report in Ahrefs Site Explorer. Note that we’re interested in finding blog posts here so if possible, we actually need to search the blog folder URL/subdomain as opposed to the entire domain. Not sure where your competitor’s blog is located? Check the Top subfolders report in Site Explorer and look for their blog path. If you don’t see anything, check the Top subdomains report instead. Some websites host their blog on a subdomain. Either way, make sure the traffic percentage for the subfolder/subfolder is in the doubt digits. If it isn’t, then it’s likely that their blog posts aren’t nested within that URL structure. In which case, stick with a domain search. Now one thing to note about this report is that the pages on sites with the most organic traffic often tend to have a lot of referring domains. That’s hardly surprising, as backlinks are a strong ranking factor. So let’s skim this report for each competitor and eyeball the RD column. What we’re looking for are pages with lots of traffic but not too many referring domains, as these are likely to be much easier to compete with. I’ll add five relevant pages that fit the bill to my sheet, plus their traffic. If you’re curious about the individual keywords for which these top pages rank, click the caret in the keywords column. Links mean referrals, “buzz,” and often as a result, more organic search traffic. So we know we need to build links, but where do we start? We find out what’s working for our competitors. 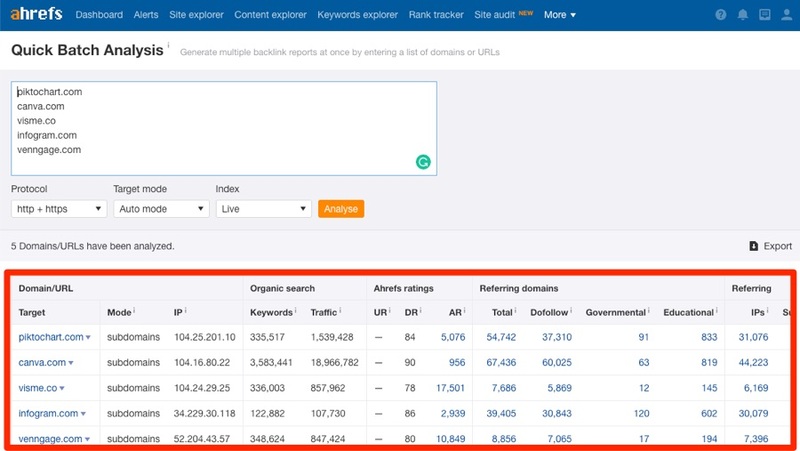 The Best by links report in Ahrefs Site Explorer shows competitors’ most linked content. If it worked for them, then something similar will likely work for us. If you’re doing this for a competitor whose blog posts aren’t nested under a subdomain (e.g., blog.domain.com/…) or subfolder (e.g., domain.com/blog/…) then use their domain instead. You’ll just need to be a little more vigilant when browsing the report. From here, I’ll add the URLs of the five most relevant top pages from each competitor, the number of referring domains to each page, and what “type” of content it is to my sheet. Now we can see at a glance what types of content work best for each competitor and in general. For example, 60% of the most linked pages articles from Venngage are listicles, and it’s a similar story for Visme too. Not every niche is the same. You may find that a different type of content is more popular in your niche. So it’s probably worth focussing our efforts on creating that type of content if we want links. On the flip side, gaps can also present opportunities. For example, Canva has a lot of links to text‐heavy content. Such content could be simplified as an infographic and possibly attract even more links. If you’re wondering how we can find out who links to our competitor’s content, all we need to do is click the number under the Referring domains column, and we’ll see all the sites linking to that page. In the two steps (#12 and #13), we’ll delve deeper into competitors’ PPC advertising. If they’re paying for traffic from a keyword, then that keyword is most likely profitable. 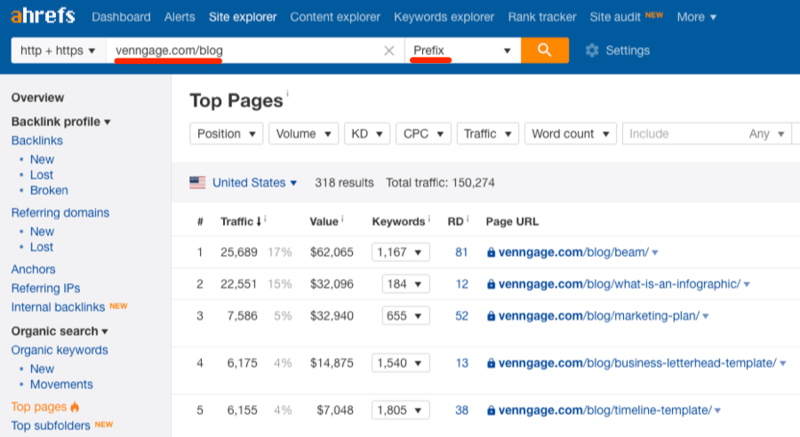 To find our competitors’ PPC keywords, let’s use the PPC keywords report in Ahrefs Site Explorer. It looks like Venngage is bidding on a lot of infographic‐related terms. Looking at competitors’ PPC data can unearth low‐volume, high‐converting keywords that are easy to skip over when conducting keyword research. 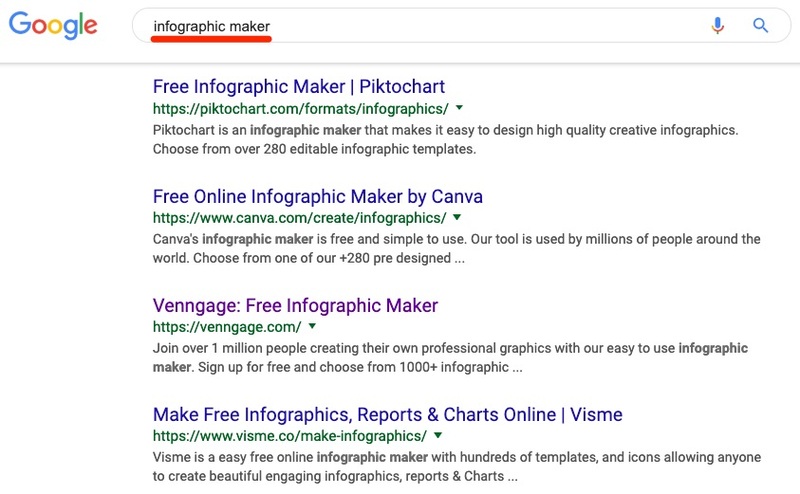 For example, a keyword like “make an infographic online” (70 searches/month) will likely have a much higher conversion rate than something like “free infographic creator” (600 searches/month). If the conversion rate for the 70 searches/month keyword is 20%, and the conversion rate for the 600 searches/month keyword is 2%, then which keyword do you think it’d make the most sense to rank for? I’m sure you’ve already done the math. That low‐volume keyword will make more money. So following that logic, I’m going to add five PPC keywords for each competitor to my sheet, but I’m going to purposely choose keywords that I think are likely to convert well. DISCLAIMER. Take this idea with a pinch of salt. Just because a competitor is spending money on PPC doesn’t necessarily mean they know what they’re doing. It’s worth testing any keywords you find using PPC yourself before you go all in trying to rank for them. Looking at competitors’ PPC ad copy can help with writing title tags and descriptions that increase CTR. That’s because competitors are paying cold hard cash to attract customers from specific keywords, and Google rewards more relevant ads with a lower CPC. So it’s in their interest to make sure their ads win the click! To preview an ad for a keyword, hover over the yellow ‘Ad’ icon. It looks like they’re using speed, cost (or lack thereof), and simplicity to entice the click. These are all things we could incorporate into our meta titles and descriptions to generate more traffic from organic search. Everything above is just the tip of the iceberg when it comes to competitive analysis for SEO. 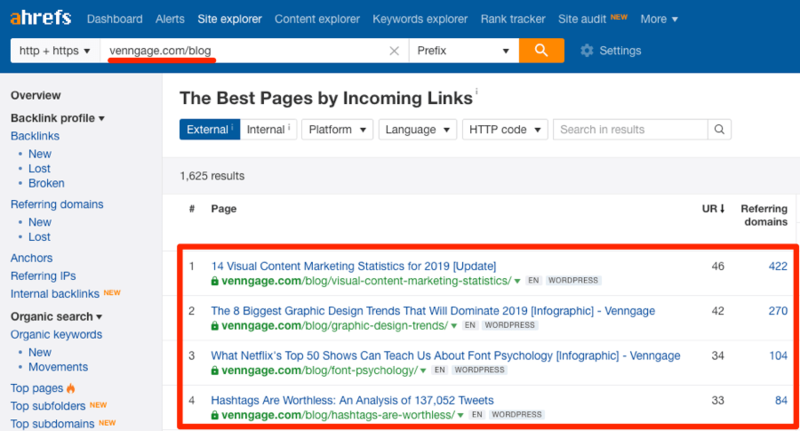 If you’re familiar with Ahrefs, then you’ll know there are a treasure trove of additional reports where we can delve deeper into our competitors’ entire marketing, content, and link building strategies. However, that can be an overwhelming place to start. My advice? Run through the process above, then use the other reports in Ahrefs (and possibly even other competitive analysis tools) to delve deeper into any areas of interest. Ready to get started? Sign up for a 7‐day trial of Ahrefs. Finally, here’s a link to my spreadsheet template (and the one I worked on throughout this guide) if you want to use the format for your own analysis.